Democracy is in recession. All over the world, we are losing our precious democracy to totalitarianism, nationalism and populism. We even hear some Lankans talk about the need for a benevolent dictator! But are those the only options we have? They all look for a solution in the past: returning to where we were before democracy was won. But is there a way to look for a solution in the future? A solution that utilises the best of our technological developments to create a better democracy and eliminate the plague of corruption that has taken over it? We all want to change the flawed political system in our country. We all know the current flawed system of governance must be changed. We all talk everyday about the need to change this corrupt system of power. But political “change” is just moving around different players in the same system, which we all know doesn’t work. We need political “innovation” to build a new system altogether. 1. Do you know that Sri Lanka is a “Democratic Socialist Republic”? That’s our constitutional name, and those words have special meanings. “We the people equally own this land and everything in it, and us the people equally decide how we use our resources as means of production.” I’ll let you ponder if that’s what’s really happening? 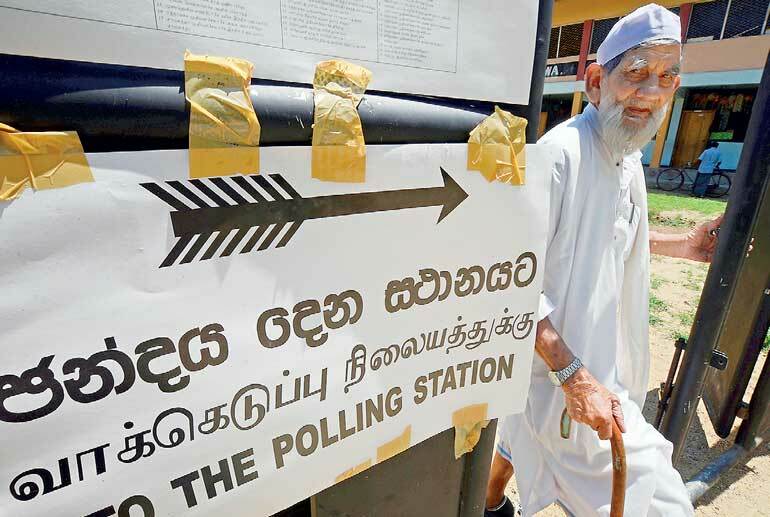 It seems most Lankans are unable to fully grasp “democracy”. They are still stuck in a monarchical or feudal or colonial construct of power. Which is why we place those politicians on high pedestals, offer garlands, bow down to their feet, and kiss their hands. The remaining few of those who worked during the British administration and some of their children seem to be subconscious subjects of the monarchy. We also see the feudal noble cast mentality still remnant in some Sinhala Kandyan clans and in certain Jaffna Tamils as they look down upon others as their subjects. There is also a Colombo-centric, English speaking, high-net-worth community which assumes nobility over others. These are all anti-democratic sentiments. But my generation, the millennials and the generation after us are not subjects of any person or institution. We are born free and we think free. And that generation of digital natives is only coming to power now. The time is now to innovate democracy in Sri Lanka. “Democracy is the rule of the people, by the people, for the people.” And democracy is built upon the principles of equality, freedom and rule-of-law. It’s the ultimate victory of the human society which enabled us to move beyond slavery, monarchy, aristocracy, oligarchy and their derivative systems of power. Direct democracy is the original version of democracy born at Agora of ancient Greece. It has no representatives. Citizens would discuss and vote directly on public issues. While in theory this sounds perfect, there are practical problems here. Firstly, as the population increase, it is difficult and expensive to carryout traditional styled referendums on every issue. It is easier to use direct democracy within a small community of people by the members expressing their views, debate and cast a vote for decision making. But at city level, provincial level and country level or even Earth level it is impractical to hold expensive referendums, at least in the traditional way we do referendums. But the bigger problem in direct democracy is in the people itself. Not all citizens are equally interested and are able to actively take part in governance. Not all citizens are equally informed about every issue to discuss and debate and cast a vote. They have bigger problems to worry about, such as feeding their children, fixing their leaky roof or finding work tomorrow. In their struggle in daily life, they forget that the root causes to their very struggle is in the system itself, and the only way they can fix it is through changing the system. Representative democracy was born as a solution to these problems. We often hear people blaming democracy as a failed concept. But what they are really blaming is how we “practice” democracy. The most popular way we enforce democracy is called ‘representative’ democracy where the people appoint a group of representatives to operate on behalf of the people. It is important we understand that representing is different from ruling. Representatives are not the rulers of the people. There are no individual or group of rulers in democracy, just the people themselves governing themselves. Representatives are appointed by the people for a specific period, to work on behalf of the people. They are supposed to serve the people and only the people. The people pay for their salaries plus for everything else from their first-class air tickets, to their luxury vehicles, to their posh houses, to their lavish dinners all the way down to their toilet paper rolls. And that’s not all, the people bear their office costs, staff costs, operational costs, project costs and basically all their costs. But most representatives do not “represent” the people and instead abuse the people’s power due to human weaknesses such as greed, corruption, ignorance and arrogance. All they need is your vote and that’s it. After that they serve themselves and their cronies at the expense of the people. Their decisions are driven only by their self-interests, and not for the people’s benefit. They create more problems for the people, than there were before. The difference is instead of one queen or one king, we now have a group of kings, queens, princes, princesses and aristocrats who see the people as their subjects. And instead of acting on behalf of the people and for the benefit of the people, those representatives strive to amass personal power and wealth through politics, corruption, influence, violence, conspiracy and collusion. Eventually it’s the people who serve the politicians and beg for their mercy. Whatever-cracy this mockery is called, it’s not democracy. Liquid democracy solves the weaknesses of direct and representative democracies by combining the best of both and using modern free, open and decentralised digital technology as the enabler. Liquid democracy gives the power back to the people by preserving and strengthening the fundamental right of each person’s sovereignty. Citizens are given complete access to all information relevant to governance, thus are able to propose, question, discuss and debate about every matter of public interest. We see this happen every day on Facebook, YouTube and Twitter where people share information, discuss, debate and even cast their votes through tools such as “Likes” or “Favourites”. Web 2.0 has broken the traditional barriers of free and open society. Liquid democracy use technology to solve the first problem of direct democracy by allowing even millions of people to create, access, discuss and share information freely and openly on matters of public interest. Liquid democracy solves the biggest weakness of direct democracy by allowing people to “delegate” their votes to someone else who they know is more knowledgeable and interested on a specific issue than them. So, the people who are informed and want to participate in governance on a specific subject can vote on behalf of somebody who is not as much. This is different from representative democracy because the owner of the vote has the absolute sovereign right of his/her vote and can change their decision, cancel the delegation or even take back the vote at any time. This gives you the fullest control of your votes. We often regret appointing certain people as representatives to governance bodies. They become corrupt, fail in their duty or simply crossover to a different party without any respect to the mandate to which they received the people’s vote in the first place. In such cases the citizens don’t have any option but to wait until the next election to make a change. But by then the damage is done and forgotten. In liquid democracy the citizens can take back their votes if they wish to do so. Liquid democracy is in fact true democracy and more. It’s built on the same principles such as equality, freedom and rule of law. And together with a decentralised digital ID, implemented cryptographically, liquid democracy becomes a system that makes possible, and simple, the implementation Universal Basic Income (UBI). We believe that every citizen has the right not just to his or her vote, but to a basic income. Having a basic income, in other words, financial “liquidity” removes the barrier for most citizens to participate in democracy. When you have food to eat, a decent home and safety, people are more engaged in governance, so they can maintain their economic freedom. All this is now possible due to the technological revolution called the “Blockchain”. The incorruptible, immutable, decentralised technology which made safe and secure cryptocurrency a reality. Web 3.0 is being built on blockchain. The new decentralised apps are being built on blockchain. Banking and finance is being built on blockchain. Legal structures are being built on Blockchain. And democracy is being built on blockchain by a pioneering organisation of modern revolutionists called “Democracy Earth” (www.democracy.earth). Facebook and Twitter are proprietary products held by centralised corporations who often use public insights for commercial use. Therefore, they can manipulate the algorithms to change public opinion. Therefore, the technological tool we ought to use for democracy must be free, open and decentralised. The governance of such system must be open, transparent and decentralised. Democracy Earth is developing that decentralised digital platform which is aptly called ‘Sovereign’. It’s a free and open source software which enables liquid democracy. I invite you to read our Social Smart Contract which explores how to build a decentralised digital democracy (www.democracy.earth). Isn’t this the change we’ve all been waiting for? Isn’t it time we the people take back the control to our hands? Decide on how to manage, grow and distribute our common resources? Decide on our common freedoms and duties? Decide our relationship with the rest of the world? And decide the future of our nation? We can’t do that by appointing the same bunch of corrupt politicians to power every four to five years. Instead of just changing poster heads, party symbols and their manifestos, we now have a practical way to fundamentally change the “system” from bottom up. Instead of addressing the symptoms, we are now able to change the very foundation of the system. There is no doubt that liquid democracy is the future of global governance. We know you have many questions. Please ask us those questions and we will start a meaningful and useful discussion. We are also planning to organise an open meet up in the coming weeks. We openly invite everybody who wants to innovate democracy in Sri Lanka to join us. For more information please send an email to eranda@democracy.earth.